Cthulhu Codex - ZineWiki - the history and culture of zines, independent media and the small press. 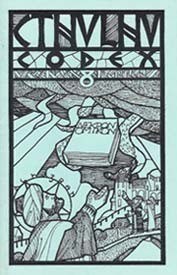 Cthulhu Codex was a Lovecraftian literary zine edited by Robert M. Price, and, as of #16, Joseph S. Pulver. From Rhode Island, U.S.A., the publication began in 1985 as The Cthulhu Codex, but with issue 6, in 1996, it assumed the name it is best remembered as, Cthulhu Codex, which it retained till the last issue, #17, published in 2000, which was called Chronicles of the Cthulhu Codex. Cthulhu Codex published fiction by writers working in the horror and weird fiction vein. Contributors include James Ambuehl (Cthulhu Cultus), David Barker (Midnight Shambler), Paul Bastienne, E.P. Berglund (Nyctalops), Mollie L. Burleson, Margaret L. Carter (The Vampire's Crypt), Pierre Comtois, David Daniel, Mark Francis, Sam Gafford, Chad Hensley, Ron Hilger, D.F. Lewis (Nemonymous), P.R. McBride, Gary Myers, Jennifer Mellwee Myers, Wilum Pugmire (Punk Lust, Queer Madness, Idiot Chaos), Sean Ramsey, Stanley Sargent, Franklyn Searight, Ann K. Schwader, Darrell Schweitzer, Frederick Stansfield, Henry J. Vester III, C. L. Werner, and R.J. Zimmerman and the editors. Also included was reprints of poetry by Clark Ashton Smith and Richard Tierney. Contributing artists include Richard Corben, Jason Eckhardt, Gervasio Gallardo, Robert H. Knox, Allen Koszowski, Gregorio Montejo, Christopher G. Porter, and comic art by Paul Montelone. A number of these stories are considered to be part of the Cthulhu Mythos. Robert M. Price also edited Crypt of Cthulhu, and Robert Price and Joseph Pulver were two of the three editors of Midnight Shambler. This page was last modified on 16 November 2012, at 21:55.